Soak the chipotle chilli in hot water for 20 minutes, then reserve the soaking water and finely chop the chilli, removing the stem and seeds. Set aside. Make a paste out of the chilli flakes, tomato paste, sherry vinegar and vegetable oil. Set aside until needed. Reduce the heat to medium, and in the same saucepan cook the onion and garlic for 5 minutes or until softened, being careful to not let the garlic burn. Add the cumin and cinnamon and cook for a further 2 minutes until fragrant. Then add the raspberry jam and ground almonds, stirring to mix well. Cook for another 2-3 minutes before adding the chopped tomatoes, chopped chipotle chilli, chilli paste from Step 2, espresso coffee and 4-5 tablespoons of the reserved chipotle soaking water. Add salt and return the turkey to the pan. Cover and cook for 30 minutes, stirring occasionally (or 10-15 minutes if using pre-cooked turkey meat from a leftover roast). Grate the dark chocolate into the saucepan, and continue cooking (covered) for another 20-25 minutes. If you feel the Mole is drying out, add a little more water. 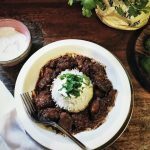 Serve Mexican Turkey Mole with Espresso Coffee with a pile of steamed white rice and a scoop of sour cream, chopped fresh parsley and squeeze of lime to taste. This recipe serves two people generously, but is easily scalable – simply double or triple the ingredients to provide more. Chipotle chillies are smoke-dried jalapeño peppers, and can usually be found in larger supermarkets, or specialist food stores. Alternatively, a poblano pepper or ancho chilli make good substitutes. If using pre-cooked turkey meat from leftover roast turkey, you can shorten the overall cooking time as the meat will just need to warm through and absorb the mole sauce, and not require such lengthy cooking.